Spendrianna Goes to China | Follow our adventures from New Orleans to China and back! Spenser and I are back in the US. It’s so peaceful. There’s just so much space to relax quietly outdoors and not be destroyed by mosquitoes or the sounds of yelling students and never ending construction. We’ll tell you just how great it is to be home in a few blog posts, but we must finish China first! So, today’s post is about the last city on our big China tour, Chengdu! Giant panda crawling on the Prada store? I think I’m in the right city! 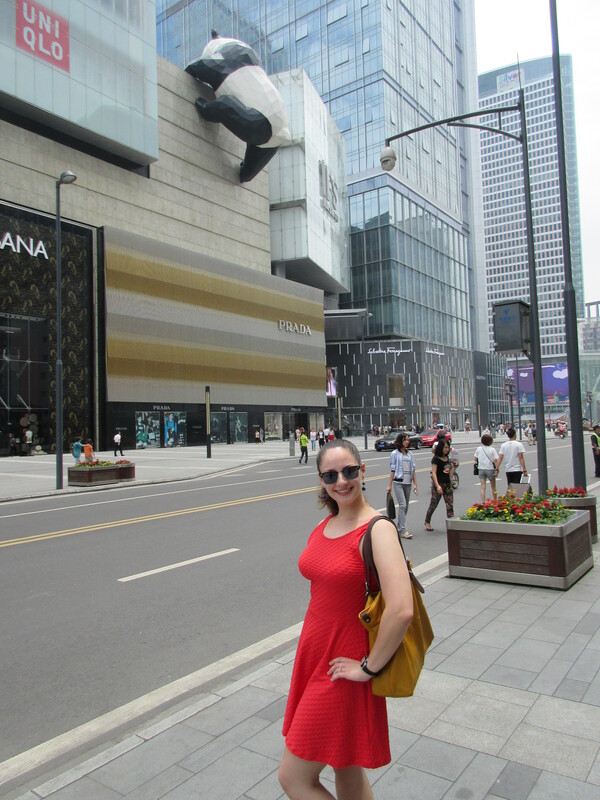 After having such a wonderful experience in Xi’an, we were a little hesitant about Chengdu. We now realize that one gigantic Chinese city often feels like all other gigantic Chinese cities, so why bother to visit Chengdu (apart from the pandas, of course)? Spenser and I wanted to figure it out so, as per usual, we dove right in and tried to enjoy the local flavor. On our first day in Chengdu, we ate spicy noodles near our hotel, got an ice cream for dessert to dull the pain, and strolled around the city. Spenser’s awesome Googling skills (Note: I usually peruse wikitravel pretty heavily, and I’d recommend it once you’re in a city) eventually led us to Jinli Ancient Street. This pedestrian market supposedly dates back to 221 BC but, like all old Chinese things (terracotta warriors excluded), it was restored to the point of looking brand new and absurdly cheesy. The traditional style buildings looked interesting and made for some good pictures, but Spenser and I would have been much more impressed if they preserved some of the extremely old things and didn’t turn it into yet another mall/tourist trap. We had an expensive beer at a tacky bar and quickly headed out for some cheaper food. Riding on the bus when we hear, “Where are you from?” Sigh. Cue the obligatory “Sure, you can practice your English with us” moment. Intentionally cropping out the hoard of tourists underneath this arch. These ladies were physically fighting about something and yelling really loudly. Troublemakers. I knew Germany would win from the beginning. Just outside of the ancient street’s walls was a Tibetan quarter filled with gorgeous shops offering Buddhist and Tibetan goods. We found a restaurant and headed inside. Our friend Laura recommended that we try yak meat if we ever got the chance and, luckily, Chengdu has a pretty large Tibetan population so yak products were everywhere. Spenser and I ordered some yogurt, a yak meat pie, and some yak dumplings and, oh my god. They were delicious. Yak meat was a little fatty but extremely tender and flavorful. The yak yogurt was very tangy and a little sprinkling of sugar made it seem decadent. The dumplings were also very good, but I was stuck on the yogurt and the meat pie. I can say with all honesty that this was one of the best meals we had in China. It was satisfying without being overly filling. Savory, tangy, sweet. It was so delicious, in fact, that we went there the next night for dinner as well. Impatiently waiting for my food. Barley flour on top of warm milk and yak cheese, I think. The second time, Spenser ordered this dish (that I just learned the name of after extensive internet search) called Tsampa or even just Pa. It’s made of roasted barley flour, cheese, “butter tea” and some seasonings. I first learned about this strange dish after watching the ever popular “A Bite of China” (FYI: if you want to learn more about Chinese food, A Bite of China is available on YouTube and it even includes English subtitles. Go check it out.) Yes, eating a bowl full of barley flour was a little strange, but it was surprisingly delicious and I can easily see how needed it would be during a chilly Tibetan winter. In the evening, Spenser and I went to a “traditional Sichuan opera” show. We arrived way too early and had a fun time watching all of the other tourists settling into their seats. 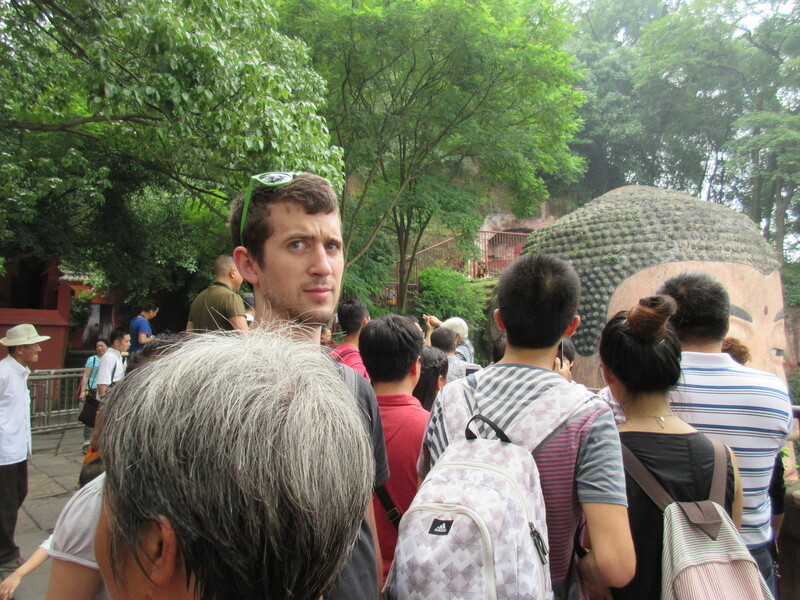 After you’re in China for awhile, you start to stare at the tourists too because you just don’t see that many foreigners out and about. Some of them were getting pre-show massages and ear cleanings (yes, ear cleanings), but Spenser and I just sat and enjoyed our Chengdu tea. When the show did start though, it was with the bang of a gong and very high-pitched singing (Chinese opera in a nutshell) and we sat through two hours of an odd Chinese variety show. Everybody run in a circle! There were shadow puppets for some reason. On our final day in Chengdu, we decided to take a two hour bus out to the smaller city of Leshan to see the GIGANTIC Leshan Stone Buddha. 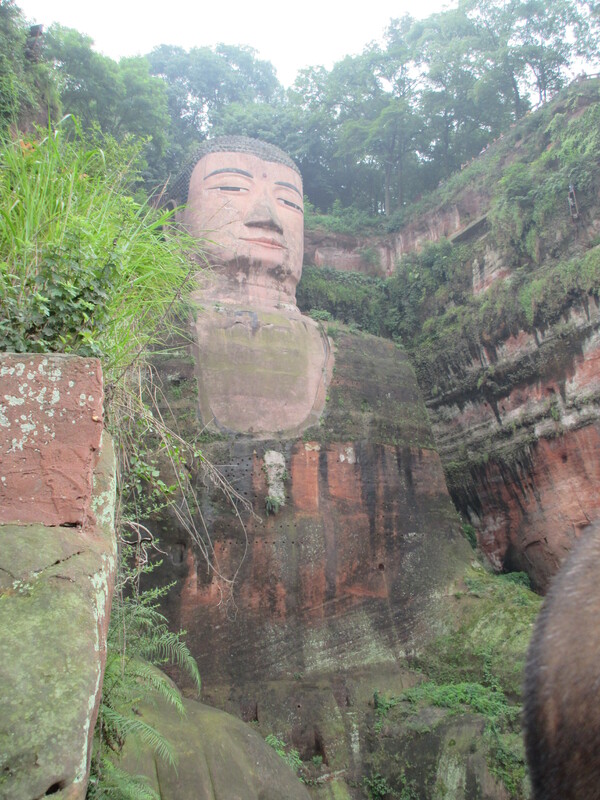 After the absurdly warm bus ride, we arrived in Leshan and took the smaller city bus out to the Buddha site. Now, I’m the first to admit that we kind of did this site wrong. We got there as early as we possibly could without spending the previous night in Leshan, and it was already packed with people. People everywhere. And it was very humid and all of us were very stinky. Look at all the tiny people! We got to touch it. Smoking right next to the “No Smoking” sign. Classy. So back to our initial question: Would you Chengdu? If you love pandas, spicy food, and yak meat, do it. Totally worth it. If you’ve already traveled around China, you can probably skip Chengdu. I would go back so Spenser could hold a panda and I could eat more yak meat…or I could just eat yak in Tibet instead? Yeah, I’ll just go to Tibet next time.